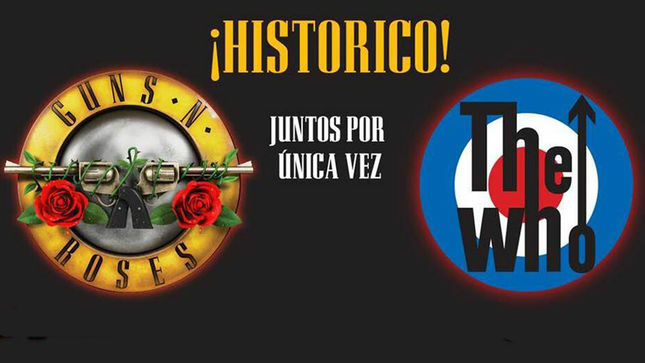 Guns N’ Roses will team up with The Who to perform in Argentina this fall. The October 1 event at Estadio La Plata in Buenos Aires will see the legendary bands share the stage together for a second time, following a September 23 appearance at Rock In Rio in Brazil. The dates mark the return of Guns N’ Roses’ Not In This Lifetime tour to South America after a fall 2016 run across the continent. The group recently completed the Asian/Oceania leg and will begin a European trek in Ireland on May 27. Meanwhile, The Who continue their lengthy farewell tour – now in its fourth year – with the South American dates following a Las Vegas residency and Outside Lands Festival gig in August. A GNR’s Nightrain pre-sale for the October 1 show begins on May 22, with general public seats going on sale May 23. Guns N” Roses have been performing The Who’s 1970 classic, “The Seeker”, throughout the worldwide tour that reunites the trio of Axl Rose, Slash and Duff McKagan.